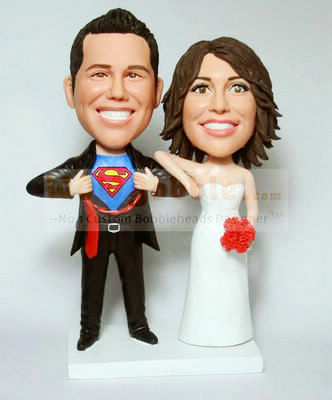 We really enjoyed our custom bobblehead cake toppers. Very good likeness, especially with our two dogs. Everyone at the reception loved the topper and it was all anyone could talk about! Feedback with the seller was very prompt. We did a couple of revisions, and I was happy with the final product. The shipping was much quicker than I expected. Would definitely recommend. ..
We hand sculpt the head to resemble the photo you provided. 3, We can custom made Superman Logo, Your Compny Logo, Team Logo or any other Logo on shirt.